It was January 27th, 1996. 15 years ago today. 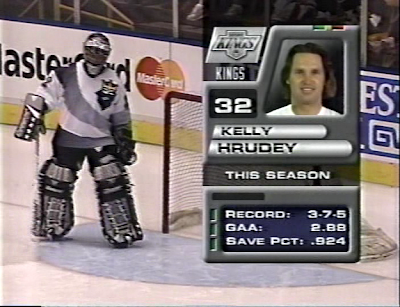 The Los Angeles Kings were coming off an 8-2 drubbing by the hands of the Hartford Whalers and headed into this game against the Mighty Ducks of Anaheim with a 16-22-11 overall record. The Kings would go on to finish that season 23rd out of 26 NHL teams while missing the playoffs for the 3rd consecutive year since making it to the Stanley Cups finals in 1993. 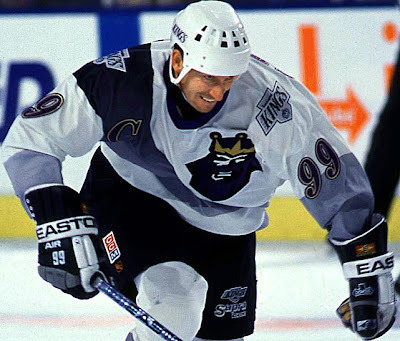 Over the course of the 1995-96 season, the Kings would trade away such fan-favorites as Rick Tocchet, Pat Conacher, Darryl Sydor, Jari Kurri, Marty McSorley and yes, even Wayne Gretzky. But when talking about that game on January 27th 15 years ago, none of this is important. For this was the game where it was unveiled. 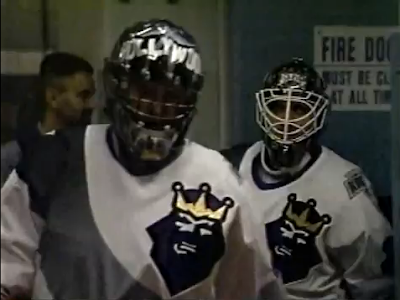 That’s right, 15 years ago today, the 3rd jersey affectionately referred to as “The Burger King Jersey” made its Hollywood debut at the Great Western Forum. And in a Royal Half Investigative Team Exclusive.. we take an in-depth look at how this logo came to be… how it came to be worn on a jersey… and how it went away, just as soon as it arrived. 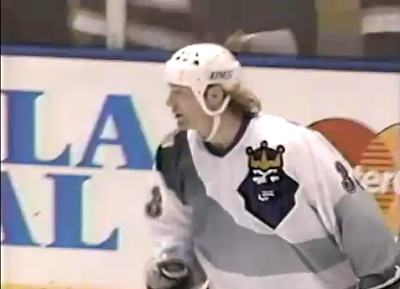 As you may know, we here at The Royal Half have always been a bit fascinated by the 3rd Jersey that the Kings debuted during that game 15 years ago. But imagine my surprise last month when I received this email from Dan Simon, head of Studio Simon, a brand identity firm specializing in sports. Needless to say, I emailed back immediately. Dan went on to tell me that he was the Creative Director at The Mednick Group in 1993, which at the time was one of the largest independent design and marketing companies on the West Coast. The Mednick Group were approached by the Los Angeles Kings who were looking for a revamp of their current logo. The owner of the firm, Scott Mednick, oversaw the project with the hands-on creative work being done by Dan and head copywriter, Peter Thornburgh. The final member of the creative team was Ken Loh, a young freelance designer, just out of college at Cal State Long Beach. Ken had designed the brand new logo for the New England Patriots… during his college internship at Evenson Design Group. 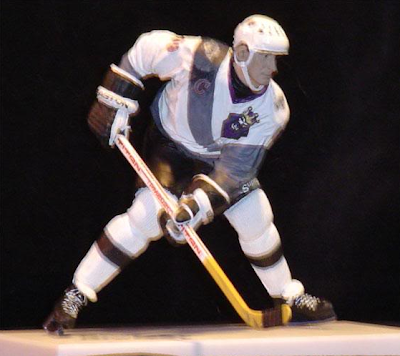 Dan Simon had been hoping to work with Ken ever since seeing his portfolio and he knew that the Kings logo revamp would be the perfect excuse to bring Ken on board. From the start, Dan knew that applying the “head-only” concept that Ken had designed for the New England Patriots would be the best approach. But as is such when it comes to developing a new brand for a sports franchise, initially there needs to be multiple looks pitched. 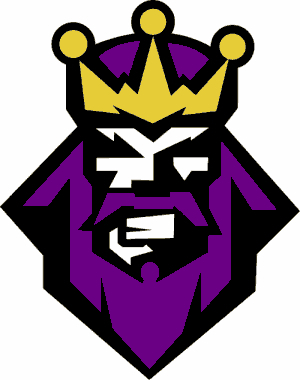 Peter Thornburgh came up with “a profile view of a bearded king, from the arms up, with a sword held perpendicularly, raised above his head” while Dan created a “coat of arms-type crest with mirror-image lions.” (FYI, this was a different design than the logo the Kings switched to in 1999.) But Dan’s hunch about the young freelance designer that was just out of college was a right one, as Ken brought to the table exactly what Dan had envisioned for the logo. Ken Loh’s original logo variations. 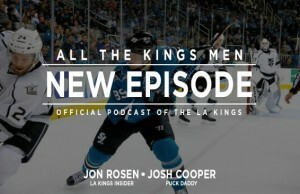 Dan can’t recall getting much, if any, feedback from the Kings. He says that most of the time, “clients are great about giving feedback, but there are also times when, for whatever reason or reasons, feedback is not given, and you are just left wondering.” For Dan, this was one of those times. So the grey and gold King head was packed away in a flat file, where so many design projects end up… never to be looked at again. But like any great Hollywood story… there was a comeback… and that flat file was re-opened only a few months later. A few months later, the phone rang at The Mednick Group and this time, it was the National Hockey League. 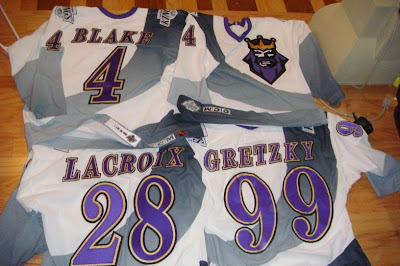 CCM had developed new technology that would allow designers to use a dye-sublimation technique to print actual gradations of color onto jerseys. This would allow designers to create a hockey jersey unlike anyone had seen before. Jerseys no longer had to be solid prints of color. 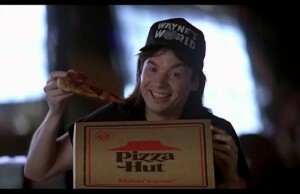 When Scott Mednick returned from his meeting with the NHL, the directive was simple…. come up with third jersey designs for the NHL that utilized gradations whenever and wherever possible. Whenever and wherever possible, indeed. Dan Simon immediately began to distance himself from this new jersey project. He reasoned that “just because there is some sort of new technology does not necessarily make it good technology for certain usages, and I felt that we were being asked to do something that was not appropriate for professional hockey uniforms.” But, if The Mednick Group was going to go forward with this NHL 3rd Jersey project… he wanted to make one creative suggestion. 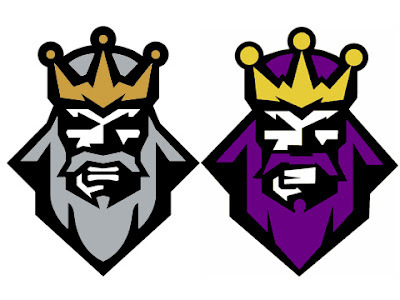 Use Ken Loh’s Los Angeles King logo design. The 3rd Jersey Project now fell into the hands of Tom Thornton, a designer at the Mednick Group. But Ken Loh remembers the project being an especially difficult one. “Trying to design jerseys to show off a new printing technique that hadn’t been perfected while working around its limitations is difficult to say the least.” And now, even Ken’s original logo had to be changed. 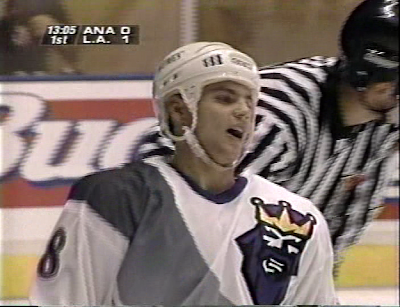 Tom was told that “the Kings were a little sensitive about being a relatively old team” so the grey beard was given a youthful dye job… to purple. I didn’t realize “Royal Purple” was a color option. 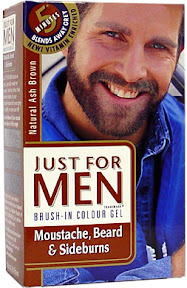 Tom knew that changing the color of the beard was a “disastrous” choice. 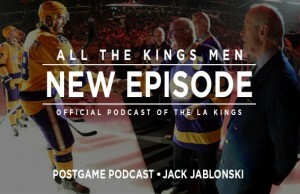 There were other factors that doomed this Los Angeles Kings 3rd Jersey from the start. Tom had designed the jersey for a black background, but the NHL wanted these jerseys to be worn for home games… and at home, the teams wore white. Tom was never thrilled with the outcome of the final product but was honored when it was recently named one of the worst jerseys of all time. The players didn’t seem too thrilled with the jersey either. 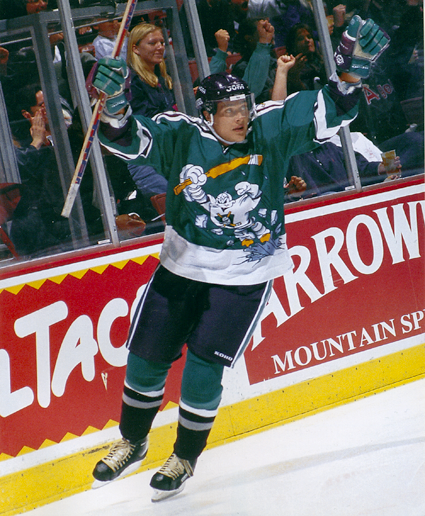 And so, on January 27th, 1996 before a national television audience on FOX… the Los Angeles Kings took on the Mighty Ducks of Anaheim, with both teams ushering in the era of the NHL 3rd Jersey. And Wayne Gretzky scored the first goal wearing it. Dmitri Khristich was so shocked by the jersey he played the entire game with his jaw dropped. So what did the players really think? 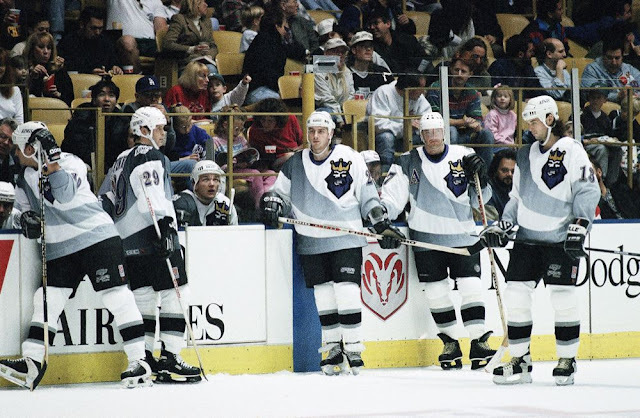 The Royal Half talked with Kings goalie Kelly Hrudey and Kings enforcer Marty McSorley about that fateful day 15 years ago. Hrudey: “I kinda remember though that a lot of us thought it was a pretty funky looking jersey, maybe ‘funky’ not in the best way. 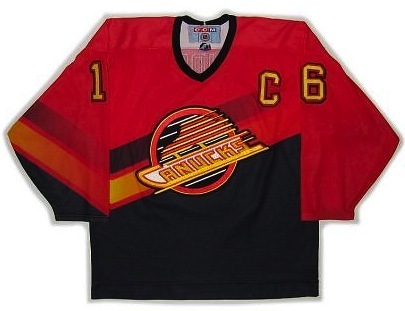 It was very strange in comparison to most hockey jerseys that you’ve ever seen before. And the color scheme was way different than something we had ever worn before, so it was an unique jersey, that’s for sure. I think, from what I remember correctly, there was a lot of chuckles. It was just so ‘unique’… I thought it was a strange looking jersey. It wasn’t what I kind of expected. Hrudey: “I’m very proud of the idea that they were not stagnant and willing to change and willing to go with the new jersey. My feelings though would be that I think I appreciate more so the less funky and the more traditional, the more retro look, the heritage aspect of an organization… more so than the ‘let’s get kinda funky with it and and make it something very unique. 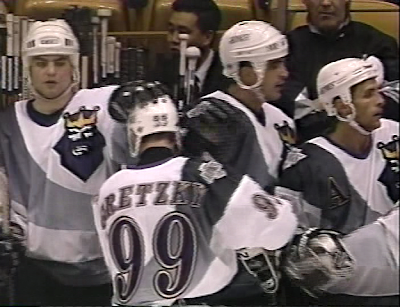 The Kings 3rd Jersey was worn a total of 8 times in 1996, 5 games at home… that January game against the Ducks, February 10th against the Sharks, February 19th against the Bruins, March 6th against the Oilers and March 23rd against the Stars. 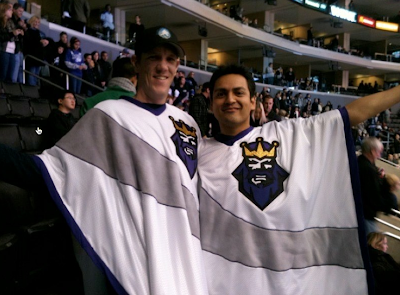 And then the Kings were kind enough to take their 3rd Jersey show on the road for their traditional March Canadian roadtrip, wearing the jerseys March 25th in Vancouver, March 27th versus the Oilers and March 29th in Calgary. The jersey was never worn after that season and perhaps that’s what has contributed most to its lore. Game used jerseys are rare at best and can fetch a premium online. Dan Simon left the Mednick Group in 1994 and today runs Studio Simon. Ken Loh went on to design the team identity for the Columbus Blue Jackets and currently is the VP of eCommerce for Oakley. Peter Thornburgh, who was a well respected copywriter, also created the logo for the Minnesota Timberwolves and is currently a Creative Director at Yahoo. 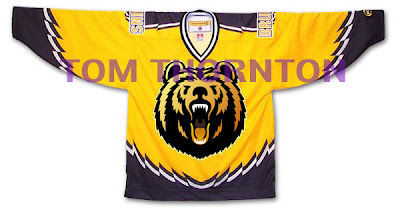 And Tom Thornton had a much better design for the Boston Bruins 3rd Jersey than the one they unveiled in 1996. 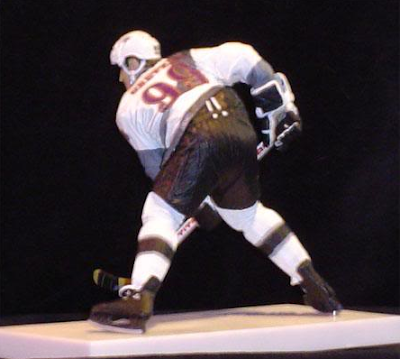 Custom Todd McFarlane Hockey Figure designer Hckeynut1 created this Burger King Jersey Wayne Gretzky figurine. It wasn’t too difficult for him after studying the jersey on the internet, although he admits he had the toughest time re-creating the shading on the sash stripe. Looking back 15 years, it’s easy to ridicule this Los Angeles Kings 3rd jersey (I didn’t even get into the jersey the Mighty Ducks are wearing in that same game 15 years ago, there just isn’t enough space on the internet for that) but the thing to remember is that prior to 1995, there was no such thing as an “Alternate” jersey. In today’s NHL, only 5 teams don’t wear a 3rd jersey during the season. 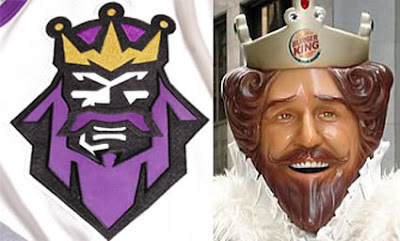 The beard may have been purple and the teeth may have been clenched… but the Los Angeles Kings angry King logo started it all. And you know what… it could have been worse as Dan Simon shared this anecdote with me. At around the same time that we worked on the Kings logo project, we had the opportunity to work on the identity for the new hockey team that was to start playing in Miami for the 1993-94 season. Disney had just named its new team the Mighty Ducks, after their movie of the same name, and Wayne Huizenga, the founder of Blockbuster Video, figured that he, too, would name his expansion franchise after his business. So, for a while there, I was designing the logo for the Florida Blockbusters (if you don’t cotton to that name, consider what might have been had he chosen to celebrate the other business by which he made his fortune: Waste Management!). I had gotten as far as working out one logo direction, featuring a sledgehammer-wielding, construction helmet-wearing fellow, before the NHL brass put the kibosh on that name. Thanks to Dan Simon, Ken Loh, Tom Thornton, Kelly Hrudey and Marty McSorley for all their help in putting this article together. Also, an extra special thanks to youtube user Disenage, for posting the amazing videos from that game 15 years ago. That is one serious f’g atrocious hockey sweater. Worst ever in North America. I’m sure there are worse in Europe.